Hennessy, Marita Cullerton, Katherine Baker, Phil Brown, Amy Crawley, Helen Hayes, Catherine Kearney, Patricia M. Kelly, Colette McKee, Martin Mialon, Melissa Petticrew, Mark Rundall, Patti Trickey, Heather White, Martin and Redsell, Sarah 2019. Time for complete transparency about conflicts of interest in public health nutrition research. HRB Open Research, Vol. 2, Issue. , p. 1. Bray, Heather J. and Ankeny, Rachel A. 2017. Not just about “the science”: science education and attitudes to genetically modified foods among women in Australia. New Genetics and Society, Vol. 36, Issue. 1, p. 1. Carocho, Márcio Morales, Patricia and Ferreira, Isabel C.F.R. 2017. Sweeteners as food additives in the XXI century: A review of what is known, and what is to come. Food and Chemical Toxicology, Vol. 107, Issue. , p. 302. Barnoya, Joaquin and Nestle, Marion 2016. RETRACTED ARTICLE: The food industry and conflicts of interest in nutrition research: A Latin American perspective. Journal of Public Health Policy, Vol. 37, Issue. 4, p. 1. Pereira, Tatiane Nunes Nascimento, Fabiana Alves do and Bandoni, Daniel Henrique 2016. Conflito de interesses na formação e prática do nutricionista: regulamentar é preciso. Ciência & Saúde Coletiva, Vol. 21, Issue. 12, p. 3833. Bes-Rastrollo, Maira Schulze, Matthias B. Ruiz-Canela, Miguel Martinez-Gonzalez, Miguel A. and Stuckler, David 2013. Financial Conflicts of Interest and Reporting Bias Regarding the Association between Sugar-Sweetened Beverages and Weight Gain: A Systematic Review of Systematic Reviews. PLoS Medicine, Vol. 10, Issue. 12, p. e1001578. Kuhner, Jeanne Incantalupo 2012. Show ‘n’ Tell Nutrition at School. Phi Delta Kappan, Vol. 93, Issue. 7, p. 16. Kraak, Vivica I Harrigan, Paige B Lawrence, Mark Harrison, Paul J Jackson, Michaela A and Swinburn, Boyd 2012. Balancing the benefits and risks of public–private partnerships to address the global double burden of malnutrition. Public Health Nutrition, Vol. 15, Issue. 03, p. 503. Wilde, Parke Morgan, Emily Roberts, Jesse Schpok, Andrea and Wilson, Tawny 2012. Relationship between funding sources and outcomes of obesity-related research. Physiology & Behavior, Vol. 107, Issue. 1, p. 172. Jenkin, G. L. Signal, L. and Thomson, G. 2011. Framing obesity: the framing contest between industry and public health at the New Zealand inquiry into obesity. Obesity Reviews, Vol. 12, Issue. 12, p. 1022. Schleifer, David 2011. We Spent a Million Bucks and Then We Had To Do Something. Bulletin of Science, Technology & Society, Vol. 31, Issue. 6, p. 460. Schinca, N. and Russolillo, G. 2011. Revista Española de Nutrición Humana y Dietética, la renovada revista de la Asociación Española de Dietistas-Nutricionistas. Revista Española de Nutrición Humana y Dietética, Vol. 15, Issue. 1, p. 1. Gillies, Peter J. and Kris-Etherton, Penny M. 2010. Opportunities and Challenges in Nutrigenetics/Nutrigenomics: Building Industry-Academia Partnerships. Journal of Nutrigenetics and Nutrigenomics, Vol. 3, Issue. 4-6, p. 296. BROWNELL, KELLY D. and WARNER, KENNETH E. 2009. The Perils of Ignoring History: Big Tobacco Played Dirty and Millions Died. How Similar Is Big Food?. Milbank Quarterly, Vol. 87, Issue. 1, p. 259. Loss, J. Böhme, M. and Nagel, E. 2009. Finanzierung von Gesundheitsförderung auf kommunaler Ebene. Prävention und Gesundheitsförderung, Vol. 4, Issue. 3, p. 195. Nkansah, Nancy Nguyen, Thao Iraninezhad, Hoda and Bero, Lisa 2009. Randomized trials assessing calcium supplementation in healthy children: relationship between industry sponsorship and study outcomes. Public Health Nutrition, Vol. 12, Issue. 10, p. 1931. Thomas, O Thabane, L Douketis, J Chu, R Westfall, A O and Allison, D B 2008. Industry funding and the reporting quality of large long-term weight loss trials. International Journal of Obesity, Vol. 32, Issue. 10, p. 1531. McComas, Katherine A. 2008. Session 5: Nutrition communication The role of trust in health communication and the effect of conflicts of interest among scientists. Proceedings of the Nutrition Society, Vol. 67, Issue. 04, p. 428. 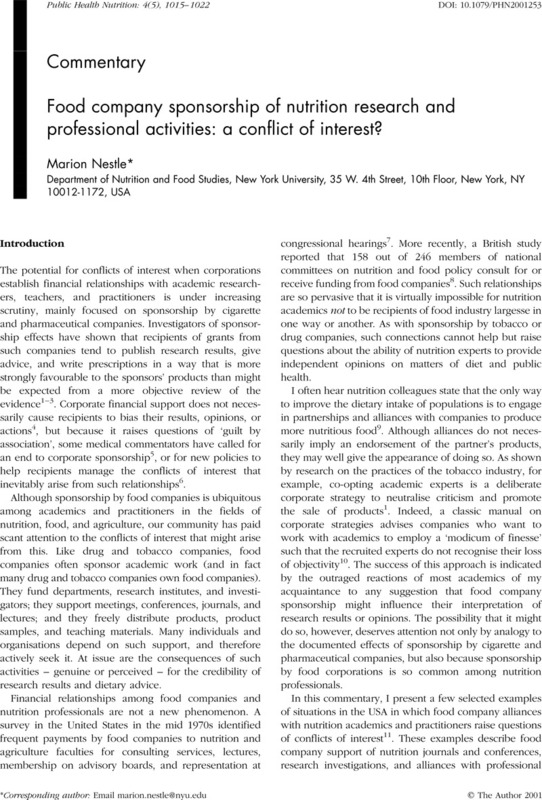 Food company sponsorship of nutrition research and professional activities: a conflict of interest? 1Kluger, R. Ashes to Ashes: America's Hundred-Year Cigarette War, the Public Health, and the Unabashed Triumph of Philip Morris. New York: Alfred A. Knopf, 1996. 2Barnes, DE, Bero, LA. Why review articles on the health effects of passive smoking reach different conclusions. JAMA 1998; 279: 1566–70. 3Cho, MK, Bero, LA. The quality of drug studies published in symposium proceedings. Ann. Intern. Med. 1996; 124: 485–9. 4Soley, LC. Leasing the Ivory Tower: The Corporate Takeover of Academia. Boston, MA: South End Press, 1995. 5Relman, AS. Separating continuing medical education from pharmaceutical marketing. JAMA 2001; 285: 2009–12. 6Moses, H, Martin, JB. Academic relationships with industry: a new model for biomedical research. JAMA 2001; 285: 933–5. 7Rosenthal, B, Jacobson, M, Bohm, M. Feeding at the company trough. Congressional Record, 08 26, 1976; H8974–7. 8Cannon, G. The Politics of Food. London: Century Hutchinson, 1987. 9Dietary Guidelines Alliance. Reaching Consumers with Meaningful Health Messages: A Handbook for Nutrition and Food Communicators. Chicago, IL: Dietary Guidelines Alliance, 1996. 10Owen, BM, Braeutigam, R. The Regulation Game: Strategic Use of the Administrative Process. Cambridge, MA: Ballinger, 1978; 7. 11Nestle, M. Food Politics: How the Food Industry Influences Nutrition and Health. Berkeley, CA: University of California Press, 2002 (in press). 12Shell, ER. The Hippocratic wars. New York Times Magazine, 06 28, 1998; 34–8. 13American Dietetic Association and American Dietetic Association Foundation. 1999 ADA/F Annual Report [Online]. Available: http://www.eatright.org/ (2000, 13 04). 14Angell, M. Is academic medicine for sale?. N. Engl. J. Med. 2000; 342: 1516–8. 15Altman, LK. New England Journal of Medicine names third editor in a year. New York Times, 05 12, 2000; A20. 16Wazana, A. Physicians and the pharmaceutical industry: is a gift ever just a gift?. JAMA 2000; 283: 373–80. 17Wilde, P. Media coverage spurs fad for vitamin pills, after year-long industry effort. Nutrition Week, 05 22, 1992; 1–6. 18Blumenthal, D, Campbell, EG, Causino, N, Louis, KS. Participation of life-science faculty in research relationships with industry. N. Engl. J. Med. 1996; 335: 1734–9. 19Krimsky, S, Rothenberg, LS, Kyle, G, Stott, P. Financial interests of authors in scientific journals: a pilot study of 14 publications. Sci. Eng. Ethics. 1996; 2: 395–410. 20Stelfox, HT, Chua, G, O'Rourke, K, Detsky, AS. Conflict of interest in the debate over calcium-channel antagonists. N. Engl. J. Med. 1998; 338: 101–6. 21Bero, LA. Accepting commercial sponsorship: disclosure helps – but is not a panacea. Brit. Med. J. 1999; 319: 653–4. 22Friedberg, M, Saffran, B, Stinson, TJ, Nelson, W, Bennett, CL. Evaluation of conflict of interest in economic analyses of new drugs used in oncology. JAMA 1999; 282: 1453–7. 23Bero, LA, Barnes, D. Industry affiliations and scientific conclusions [letter]. JAMA 1998; 280: 1142. 24Avoid financial ‘correctness’: insistence that authors declare business interests in papers is beside the point [editorial]. Nature 1997; 385: 469. 25Campbell, P, Dhand, R. Nature insight: obesity. Nature 2000; 404: 631–77. 26Bray, GA, Tartaglia, LA. Medicinal strategies in the treatment of obesity. Nature 2000; 404: 672–7. 27Squires, S. Food and choice: Heart Association's plan to endorse certain products is a bold gamble in educating a confused public. Washington Post Health, 07 5, 1988; 9. 28Sugarman, C. What price approval? Heart Association's planraises food firms' pressure. Washington Post, 08 30, 1989; E1, E4. 29Parachini, A. Food fight: Heart Association plan to label ‘healthy’ foods drawing fire from agencies, nutritionists. Washington Post, 08 2, 1988; E1, E6. 30 State attorneys general support FDA position on AHA HeartGuide label. Nutrition Week, 02 8, 1990; 1. 31American Institute of Nutrition and The American Society for Clinical Nutrition. Objections to ‘Seal of Approval Programs’. Am. J. Clin. Nutr. 1990; 51(4): unpaginated. 32Angier, N. Heart Association cancels its program to rate foods. New York Times, 04 3, 1990; A1, C6. 33American Heart Association. Food for thought [flier]. 10, 1997. 34Kellogg Company. Letter in press release addressed to Dear Health Professional. Battle Creek, MI, 02, 1997. 35American Heart Association. Food certification program [Online]. Available: http://americanheart.org/ (2000, 15 04). 36Raeburn, P. The Heart Association is selling its soul. Business Week, 11 24, 1997; 96. 37Florida Grapefruit Juice. Fight heart disease; drink Florida Grapefruit Juice [advertisement]. New York Times, 10 29, 1997; F4. 38Burros, M. Additives in advice on food. New York Times, 11 15, 1995; C1, C5. 39American Dietetic Association. Position of the American Dietetic Association: nutrition education for the public. J. Am. Diet. Assoc. 1996; 96: 1183–7. 40McDonald's Corporation. American Dietetic Association and McDonald's partner to teach kids the fundamentals of nutrition [news release]. Oak Brook, IL, 02 24, 1993. 41American Dietetic Association. Nutrition Fact Sheets [Online]. Available: http://www.eatright.org/ (1997, 11 15; 2000, 04 10). 42Gallagher, A. Taking a stand on emerging issues. J. Am. Diet. Assoc. 2000; 100: 410. 43Kellogg's full-page colour advertisement. J. Am. Diet. Assoc. 2000; 100: 496. 44 Kellogg's claim for heart benefits challenged by CSPI. Food Regulation Weekly, 07 3, 2000; 10. 45American Dietetic Association. Code of ethics for the profession of dietetics. J. Am. Diet. Assoc. 1999; 99: 109–13. 46McNutt, K. Conflict of interest. J. Am. Diet. Assoc. 1999; 99: 29–30. 47Rock, CL. Conflict of interest: an import issue in nutrition research and communications. J. Am. Diet. Assoc. 1999; 99: 31–2. 48Food and Nutrition Board. Toward Healthful Diets. Washington, DC: National Academy of Sciences, 1980. 49Brody, JE. Experts assail report declaring curb on cholesterol isn't needed. New York Times, 06 1, 1980; A1. 50Broad, WJ. Academy says curb on cholesterol not needed. Science 1980; 208: 1354–5. 51Wade, N. Food Board's fat report hits fire. Science 1980; 209: 248–9. 52 National Academy of Sciences tightens its grip on the Food and Nutrition Board. Nutrition Today, 01/02 1984; 31–2. 53Krimsky, S, Rothenberg, LS. Financial interest and its disclosure in scientific publications. JAMA 1998; 280: 225–6. 54Food and Drug Administration. Final guidance on industry-supported scientific and educational activities: notice. Federal Register; 62: 64074–100 (12 3, 1997). 55Stolberg, SG. New rules will force doctors to disclose ties to drug industry. New York Times, 02 3, 1998; A12. 56 The Lancet. Writing for The Lancet [Online]. Available: http://www.thelancet.com/ (2000, 10 04). 57British Medical Journal. Declaration of competing interest: guidance for authors [Online]. Available: http://www.bmj.com/guides (1999, 17 07). 58Krimsky, S, Rothenberg, LS. Conflict of interest policies in science and medical journals: editorial practices and author disclosures. Sci. Eng. Ethics. 2001; 7: 205–18. 59Meydani, SN, Meydani, M, Leka, L, Blumberg, J. Vitamin E supplementation and immune response in elderly patients [letter]. JAMA 1998; 279: 505–6. 60Rothman, KJ. Conflict of interest: the new McCarthyism in science. JAMA 1993; 269: 2782–4. 61Royal College of Paediatrics and Child Health. Commercial sponsorship in the Royal College of Paediatrics and Child Health. London: Royal College of Paediatrics and Child Health, 1999. 62Kassirer, JP. Financial indigestion. JAMA 2000; 284: 2156–7. 63Bero, LA. Disclosure policies for gifts from industry to academic faculty. JAMA 1998; 279: 1031. 64 US Department of Health and Human Services. Financial relationships in clinical research: issues for institutions, clinical investigators, and IRBs to consider when dealing with issues of financial interests and human subject protection [Online]. Available: http://ohrp.osophs.dhhs.gov/ (2001, 11 04). 65Tobin, DS, Dwyer, J, Gussow, JD. Cooperative relationships between professional societies and the food industry: opportunities or problems?. Nutr. Rev. 1992; 50: 300–306. 66Levine, J, Gussow, JD. Consider the source. New York Times, 09 30, 1994; A31.